for Blogging for Books (they sent me a book for free so I can tell you all about it). My husband is 5 years sober and I drink alcohol maybe 5 times a year. BUT making wine, cider and infused liquors is a really traditional way to preserve the harvest. And I’m all about preserving the harvest. Not to mention alcohol makes an awesome gift!
! It couldn’t be more perfect. The recipes are separated into a few sections, the first one is for infused alcohols. This is the very beginning, baby-step, basic into to making fancy alcohol. The recipes in this chapter start with some type of basic purchased alcohol (vodka, gin, whiskey) and you add something to it, let it sit, strain and enjoy. I suppose you could mess something up but you’re going to have to try pretty hard. I really wanted to try the blackberry whiskey (my preferred sippin’ beverage is honey whiskey) but I misplaced the book and forgot all about it. That brings me to my only problem with the book, it’s small. I lost it on my bookcase because Mary was able to push it so far back that it got stuck behind the other books. I haven’t been bothered by it but it also has small text. After the chapter on infused alcohol are sections on Wine, Hard Cider and Beer. Unlike the infused liquors these recipes are way more involved. Lots of sterilizing and equipment. I’m hoping I’ll be able to scratch together enough supplies to experiment with a batch of dandelion wine this spring. It seems like a good intro, if it’s awful I’ve only wasted a bucket of flowers, not a ton of fruit! The instructions are clear and easy to follow, some steps even have photos to follow along with. The author has a very friendly voice, the book is full of his experiences and lots of do-as-I-say-not-as-I-do advice. He is also making his booze in England so some terminology is a little bit strange but it’s not off putting and I’ve never found it to be confusing or unclear. I’m hoping that in a few years out apple trees will be filled and we’ll be able to try our hand at sweet cider and hopefully a little bit of hard cider. I don’t like beer at all but I’ll drink the occasional hard cider in the fall. I even have my eye on a few old cider type apple trees that aren’t good for anything but cider. I really do like this book even though I haven’t been able to do a whole lot with it I can see myself using it a lot through the coming years as I get more confident in my skills and I hope I can live up to my ambitions. If you’re looking for a book that’s going to introduce you to art of making booze at home this is a great place to start. 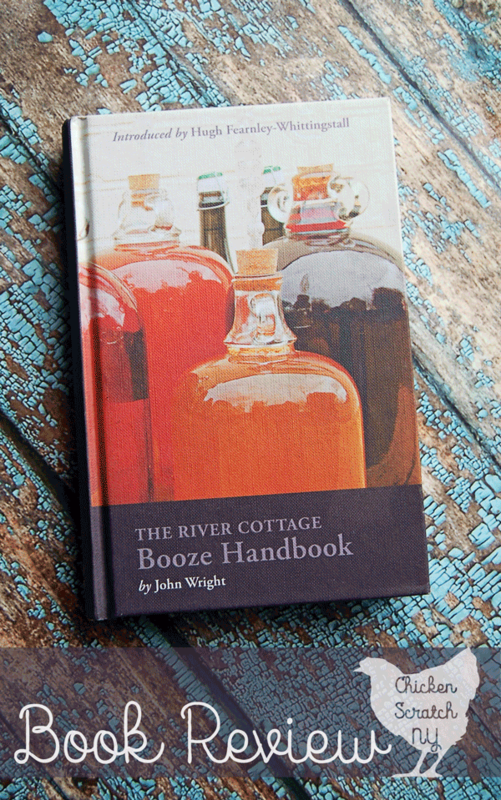 This sounds like an awesome book for learning to make your own liquors at home. They do make very nice gifts during the holidays! I will have to check this out! Ive always wanted to make my own wine. I had a friend that use to bring me honesuckle wine and it use to knock my socks off. Im not the drinker I was in my younger years maybe a few times a year. I just can’t recover like I use too. I know a few people that would love this book. That is so cool that you try to make your own. I think the book mush have lots of neat tips and ideas for those that are into learning how to make it. You have apple trees?! How fun! Seriously, though, Having an orchard and creating my own libations would definitely be high on the bucket list. I will have to check out this book.